We All Love the Yellow Submarine! In the land of submarines. The yellow submarine isn’t just an invention of the Beatles—it exists for real. And it had gotten a paint job, courtesy of our friend Erik Baard and his HarborLab crew. So we decided it was high time to paddle out and see the results. Let me back up… in the waters of Coney Island Creek, just off Gravesend Bay, there rests—amazingly, improbably!—a yellow submarine. We’ve told a fuller story here, but suffice it to say that the story of its existence just underscores the crazy sense of possibility that permeated the 1960s. But it’s closing in on 50 years since the yellow submarine was launched, and it had become somewhat the worse for wear. So when we heard it had recovered its original cheerful coloring, we had to go see. Maybe the magic was in the pasta. 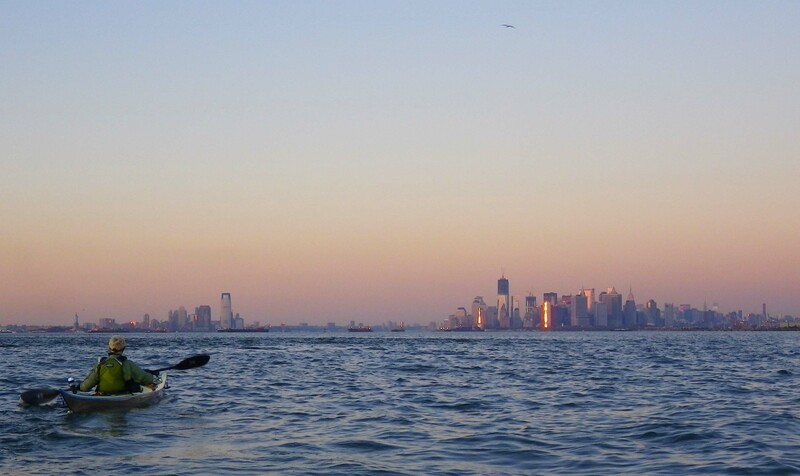 This year, Vlad and I signed up to provide kayak support for the Ederle Swim, a 17.5-mile open-water swim from Manhattan to Sandy Hook, New Jersey. Vlad has done it several times, but this was my first time accompanying swimmers to Sandy Hook (though we’ve paddled there many times). We’d each been assigned a swimmer, and the day before the swim, the organizers, NYC Swim, sent us the swimmers’ email addresses. So I reached out to “my” swimmer, Andrea Varalli, mentioned that I’d done the paddle many times, and offered what advice I could, including the detailed blogs Vlad has posted on Wind Against Current about his previous Ederle Swims (here, here, here, and here). Next thing I knew, Vlad and I agreed to meet Andrea and his support team for dinner at a “real Italian restaurant” (as Andrea called it), Piacere. (Pleasure, in Italian.) We had guessed (correctly as it turned out) that Andrea was “real Italian”—not merely of Italian descent. So the “real Italian” restaurant was sure to be a treat! Ailsa’s travel-themed photo challenge this week is Clean. Many are incredulous that the waters around Manhattan are clean enough to swim in. 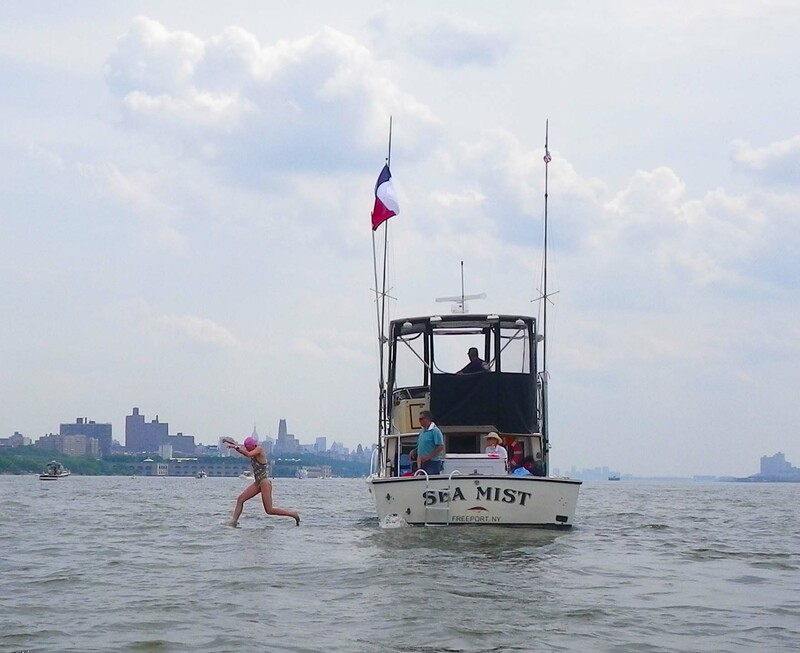 These are photos from the last three years of the Manhattan Island Marathon Swim, a world-class, 28.5-mile swim around Manhattan, organized by NYC Swim every June or July. (Stories and more photos are here, here, and here.) This year on June 14, June 28, and July 12! 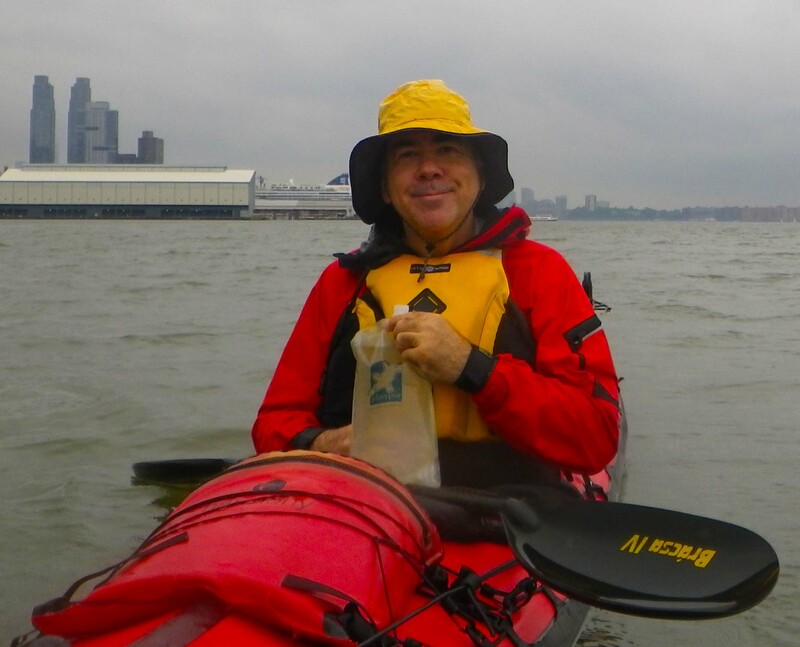 On Sunday a week ago, August 18th, I found myself once more in my kayak accompanying a long-distance swimmer through New York Harbor. 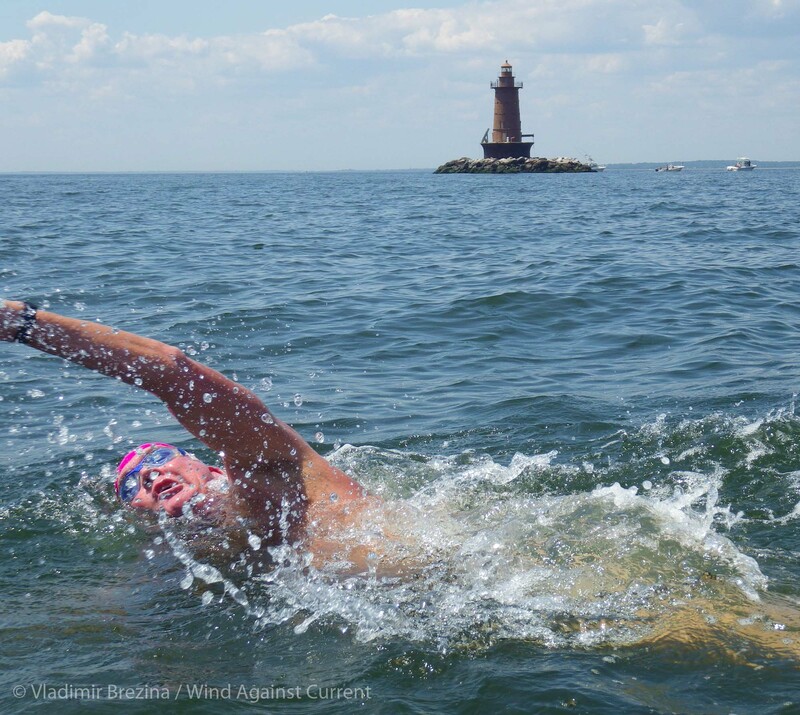 It was the day of this year’s Ederle Swim, a 17.5 -mile open-water swim from Manhattan to Sandy Hook, New Jersey, organized by NYC Swim. This year’s swim was in fact the centennial swim, since the first successful swim over that course, after a number of failed attempts, occurred a hundred years ago almost to the day, on August 28th, 1913. My swimmer this year was Barbara Held, from San Diego, California. 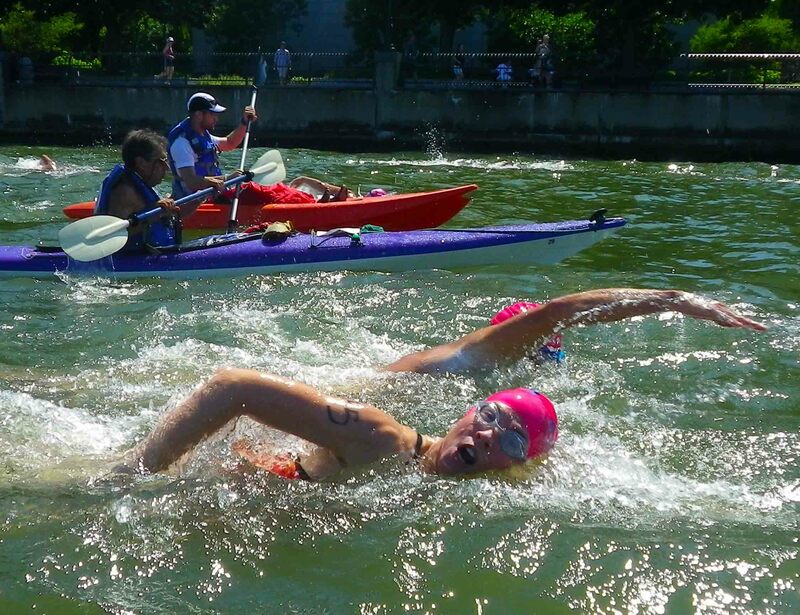 Having completed her Triple Crown of Open Water Swimming—the Manhattan Island Marathon Swim, the Catalina Channel, and the English Channel—Barbara was looking for new challenges! 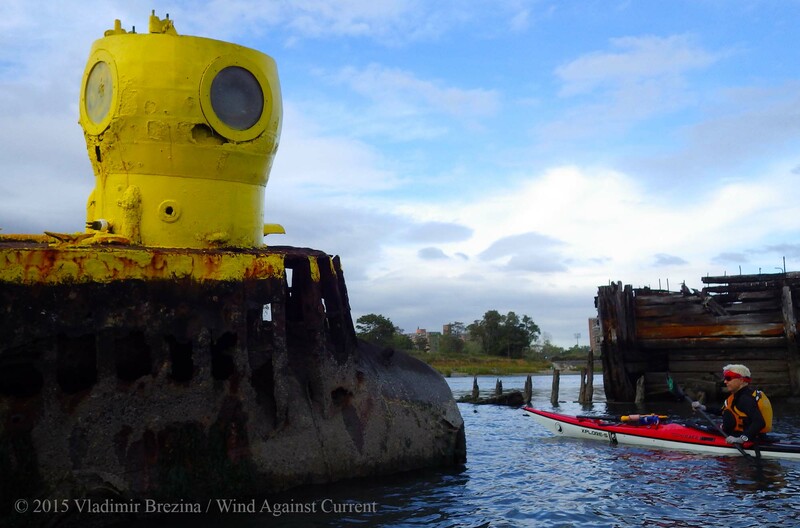 Unlike Johna, I’ve been reluctant to write too much about myself on Wind Against Current. Who would want to read that stuff? And now I don’t have to write anything—NYC Swim has done it for me. 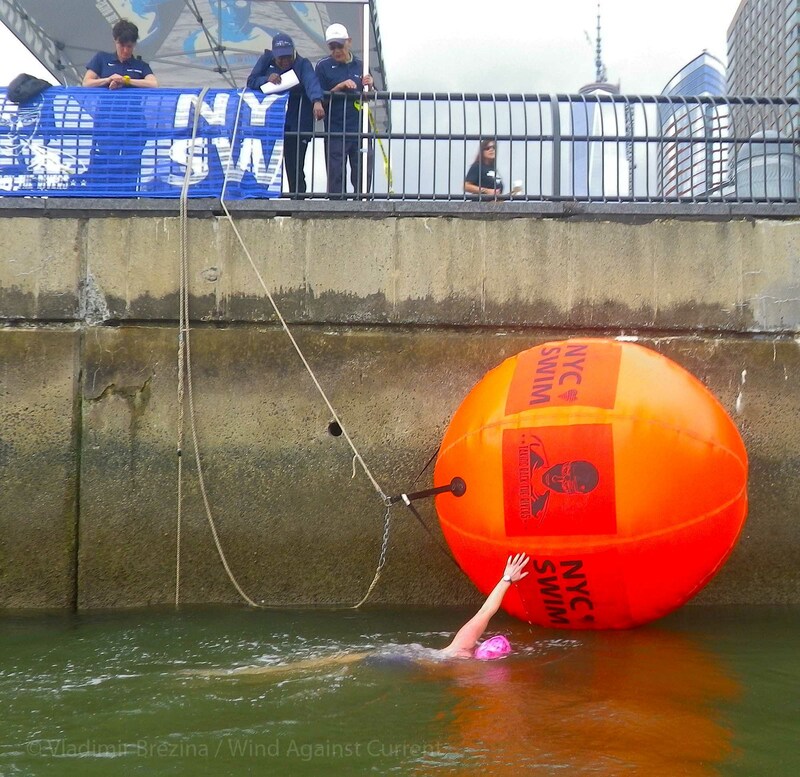 Each summer, NYC Swim organizes a series of shorter and longer swims in New York City’s waterways. 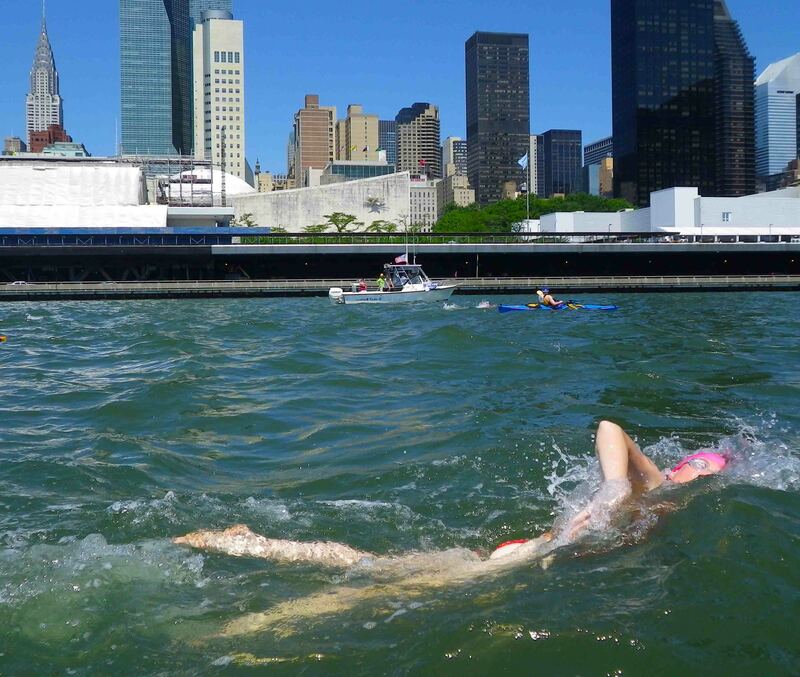 The premier event is the Manhattan Island Marathon Swim (MIMS), a 28.5-mile race around Manhattan. Along with the English Channel and Catalina Channel swims, it is one of the three swims in the Triple Crown of Open Water Swimming. Each swimmer is accompanied by a kayaker (as well as a motor boat). 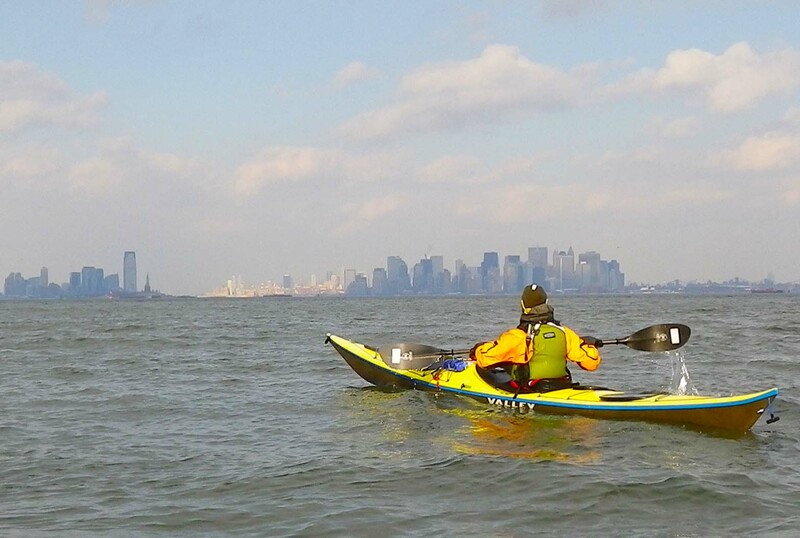 So on Saturday a week ago, I kayaked around Manhattan with swimmer Katy Dooley. Katy already knew all about swimming around Manhattan, having swum in MIMS in 2011 as well as 2012—but in both cases as part of a relay. This was going to be her first solo round-Manhattan swim. This year’s MIMS turned out to be interesting, to say the least. 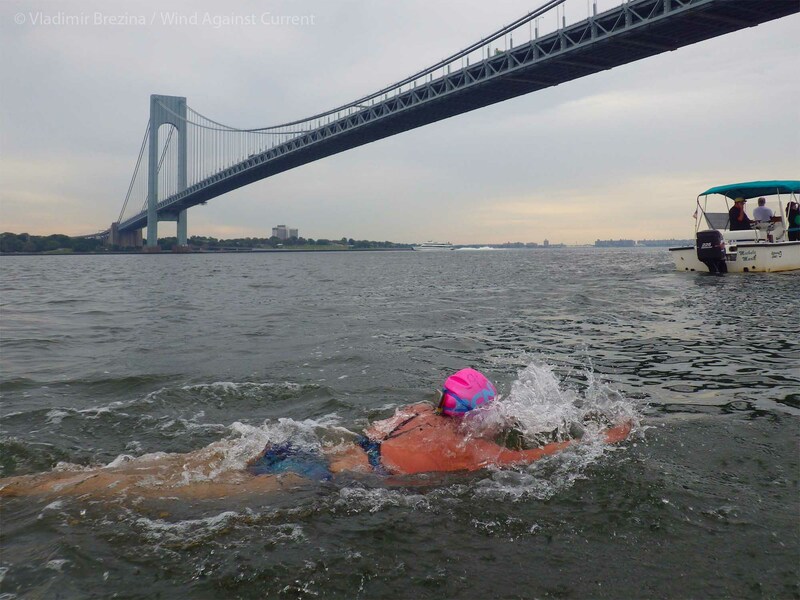 Due to a cascading series of problems, some traceable all the way back to last year’s Hurricane Sandy, others to the unseasonably cold water, and still others to the heavy rains in the previous couple of days, only 11 of the 39 solo swimmers completed the entire swim unassisted. But Katy was one of them! She powered through, finishing 5th (and 2nd woman) in 7 hours, 44 minutes. 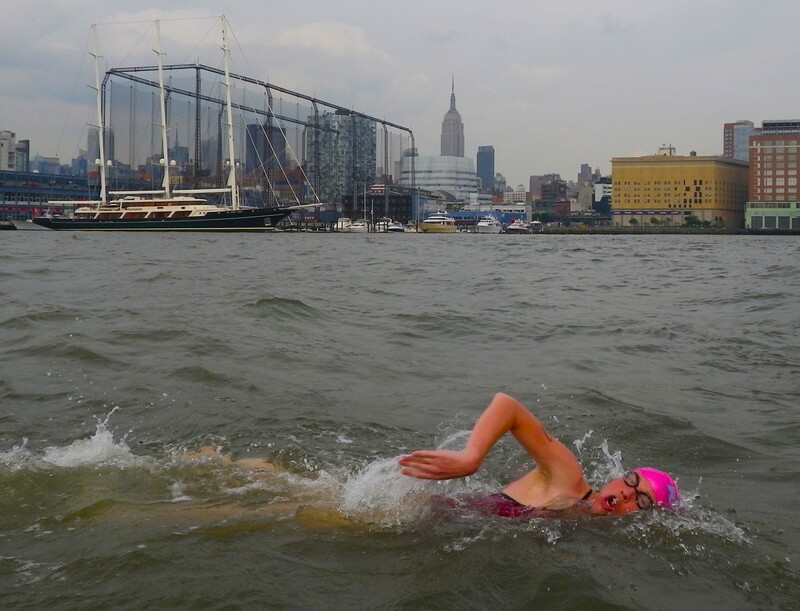 And by completing her swim around Manhattan, she became only the 69th swimmer to join the elite club of Triple Crown open water swimmers. A major accomplishment on a very difficult day—and inspiring to watch from close up! I’ll write more about the swim in a future post. (My writeups of MIMS 2011 and 2012 are here and here.) But in the meantime, here are some of the photographic highlights of MIMS 2013. This week’s Photo Challenge is Near and Far. 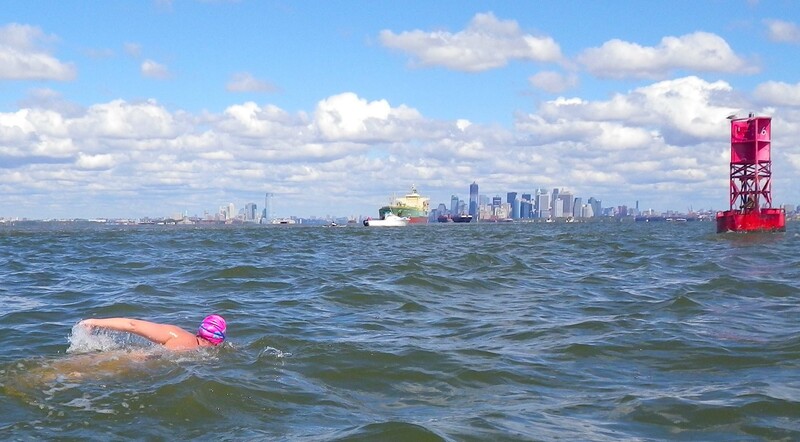 I’ve already posted one response to this challenge—three of my annual photos of a round-Manhattan swimmer next to my kayak with the Empire State Building in the distance. 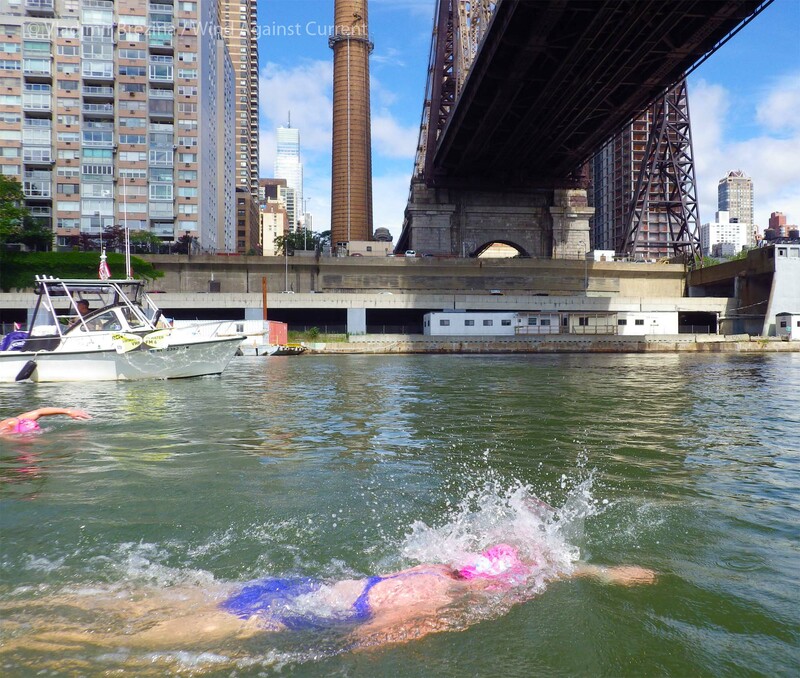 For more on “Paddling to Manhattan Island”, see here; for more on swimming there, see here and here.